Plaid's Martha Stewart Crafts Glass line, available exclusively at Michaels, makes DIY glass projects just as simple and elegant as one would expect. Martha is, after all, the grande dame of beautiful living. 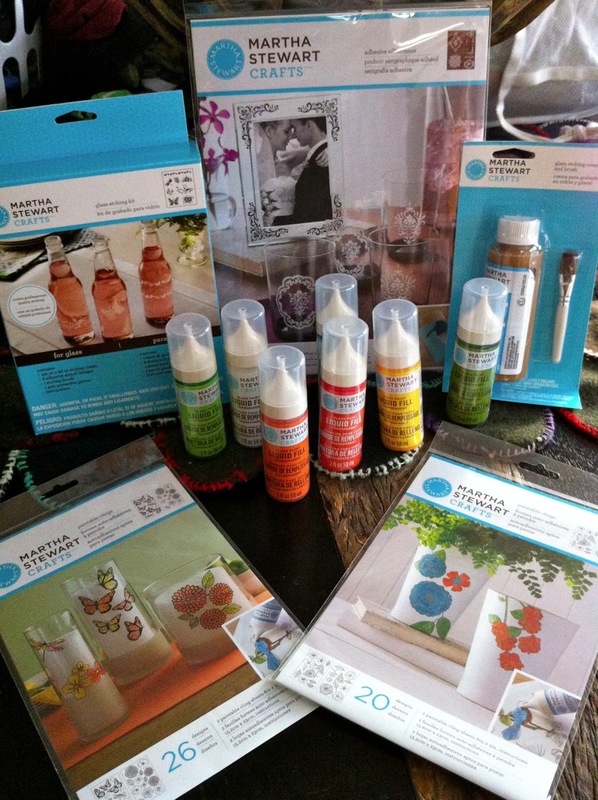 I received a care package of some of her most popular products, including paintable glass clings and glass etching kits. Roo's anxious to try the clings, which are essentially stained glass stickers with black or silver grey "leading" that can be customized by hand-tinting with transparent glass paint. The clings feature naturalistic motifs in Martha standards like hydrangeas and butterflies. They stick to any smooth surface and can be reused multiple times so long as you keep them clean. Very pretty and an easy way for tweens to make fancy crafts. I knew I wanted to do something with the glass etching cream for Valentine's Day. I first encountered glass etching in an art class in junior high. My project featured Terry Hall from Fun Boy Three ensconced in tropical fauna as a border on a 12" x 12" mirror square. Nope, nobody knew who it was but it was actually pretty cool. Anyway, I haven't really dabbled in glass etching since. When I found a vintage-styled gumball dispenser on sale, though, I knew I wanted to customize it. The Martha Stewart Crafts Glass Etching Kit comes with everything you need to get started: etching cream, gloves, instructions, reusable adhesive silkscreen stencils and the most adorable 1/2" brush. Roo was using some foam stickers to make Valentines for her classmates, though, and I thought I'd put her trash to good reuse as heart stencils. Look at the tiny brush! I love it! This kit is truly idiot-proof. You just place your stencil on clean glass and apply a thick, even layer of etching cream using the cutest brush in the galaxy. Then you wander off and do something else for a half hour or so. The instructions say 15 minutes but I like to give it a little more time to set. One thing: the instructions make it look like the etching cream is white but the stuff in my bottle was more like caramel. Don't eat it, though. After the etching cream sets, take it to the sink, peel off the stickers and wash the glass. You should have a brand new decorative item. Easy peasy, I told you! I was losing daylight inside, so I took the gumball machine outside to photograph. For all you photo geeks, it's like permanent bokeh! So adorable. Even if three pounds of gumballs didn't fill the whole machine. Ugh. What a fantastic Valentine's Day gift/craft. Great job. Ooh, so cute! I love those products. 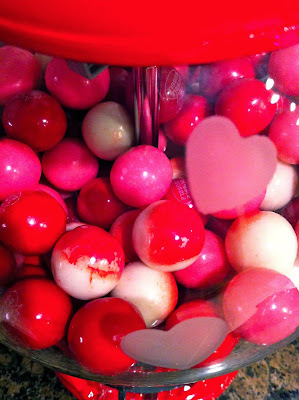 The gumball machine was a fabulous idea, and worth all that $$$$ in gumballs. So cute! I have a gumball machine in the office. I never thought about etching the globe! That is so cute. You could put a bunch of different types of candies in there too! Pretty cool, kids would love it. Oh my gosh! Soooo cute!